Current sensor unit accessories for digital power meters and power analyzers DC to 100 kHz/1000 a peak guaranteed calibration with power analyzers. 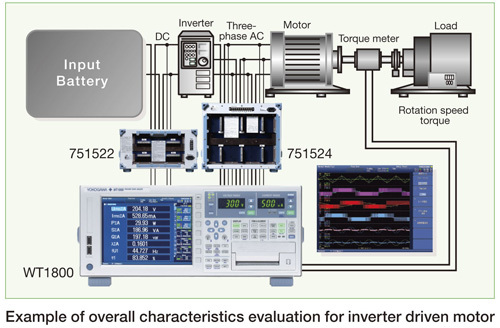 Current sensor units can be used for large-current power measurements, which are difficult to take directly in excess of a power analyzers rating. With the ability to measure a wide range of frequencies from DC to 100 kHz with high precision, the current sensor units can be used in a variety of power measurement applications, such as HEV, EV inverter drive motors and fuel cells. In addition, they can be used in combination with Yokogawa's WT Series of Power analyzers and PX Power scope. This makes them well-suited to power measurement applications requiring an especially high level of precision. Use model 751522 for single-phase measurements and model 751524 for three-phase measurements.